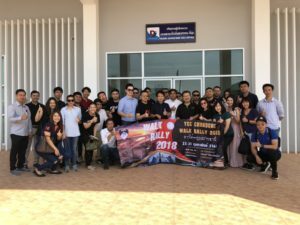 On February 25, 2018, about 40 young businessmen of Ubon Ratchathany Province and Chonbury Province, Thailand visited Pakse-Japan SME SEZ. On February25, 2018, about 40 young businessmen of Ubon Ratchathany Province and Chonboury Province, Thailand visited Pakse-Japan SME SEZ. Ubon Ratchathany is the nearest Province of Thailand borders Pakse city, Champasak Province and Chonboury Province has an industrial park which many Japanese companies accumulated. It is expected work in collaboration with Japanese companies which advanced into Pakse.